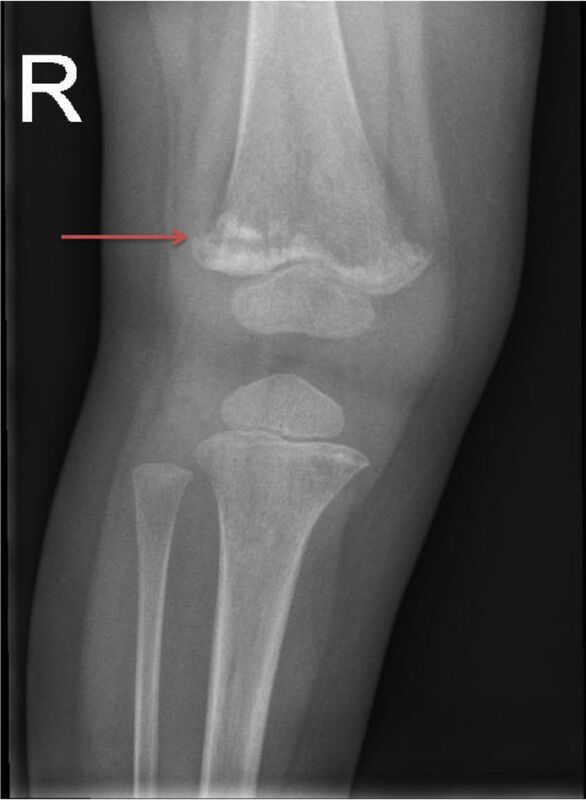 A 2-year-old boy, who was previously well, was admitted for limping associated with left knee pain of 1 month duration. There was no history of witnessed trauma or significant infective symptoms. Systemic review was otherwise unremarkable. Prior to his onset of signs, he was able to cruise with support, and had some mild isolated speech delay. There was no significant family history of medical conditions. His main caregivers on weekdays were two sets of grandparents when his parents were working, while his parents took over his care on weekends. Physical examination was normal, except for tenderness of his left knee joint and his inability to weight-bear. 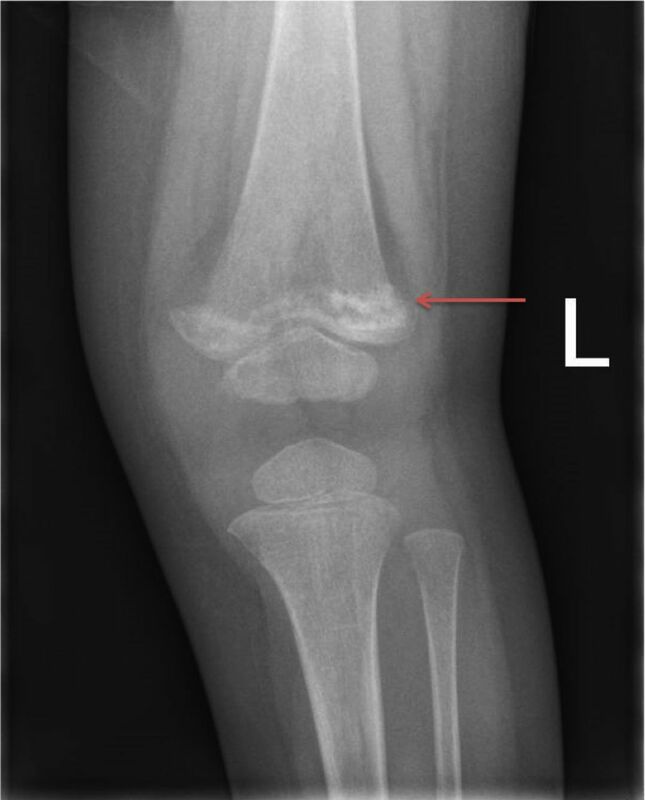 An X-ray of his left knee joint showed a healing fracture of the left distal femoral metaphysis with associated bony sclerosis at the fracture margins, as well as periosteal reaction in the distal femur. In addition, there were also areas of lucencies in the left proximal tibia metaphysis (figure 1). Left distal femur healing fracture with surrounding sclerosis. Question 1 What are the possible causes of his current presentation? His full blood count revealed mild normochromic normocytic anaemia (haemoglobin 10.9 g/L), total white cell count of 6.70×109/L and platelet count of 144×109/L. The peripheral blood film did not show any blast cells. His liver function test showed mild transaminases (aspartate aminotransferase 106 U/L, alanine aminotransferase 244 U/L). His renal function test, bone panel, uric acid and lactate dehydrogenase levels were all normal. A skeletal survey showed presence of metaphyseal fractures of different ages at several sites, as well as subtle areas of lucencies in the right proximal tibia metaphysis (figures 2 and 3). Right distal femur healing fracture with surrounding sclerosis. Possible healing fracture in right proximal humerus, with surrounding sclerosis. He was managed conservatively and subsequently discharged back home to the same caregivers with plans for home monitoring visits by social services. He was readmitted 1 month later for worsening symptoms of 1 week duration. He was unable to crawl and had developed a fever over 1 day. Systemic review was otherwise unremarkable. Other than a mild normochromic, normocytic anaemia, the full blood count was normal. Physical examination was normal, except for a slightly swollen right knee joint. A right knee X-ray showed worsening osteopenia and sclerosis in keeping with a healing fracture. An MRI showed diffuse marrow changes in the femur with patchy enhancement. 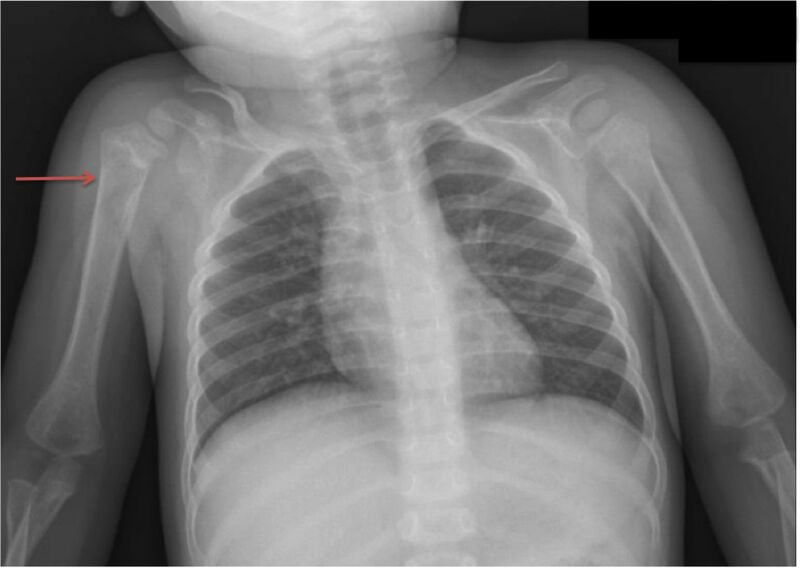 Question 2 Which further investigation(s) would be useful in establishing his diagnosis? Answers can be found on page 3.